I was in Lidl (a supermarket in the UK) and saw this adorable little Bundt pan. They had other's that were slightly bigger, but honestly, this was too cute to pass up. This adorable little bundt pan is around 5 1/2 inches wide at the top (14cm) which would be the bottom of the cake. It's roughly 4 inches at the base (10cm) which would be the top of the cake and a little over 2 1/2 inches tall (6.5cm). Being a bundt tin, it has a cylinder inside the pan, which will create a hole in the middle of the cake, so it looks like a ring. I've seen so many beautiful pictures recently of bundt cakes and the astonishingly beautiful pans by NordicWear and have been dying to make one. I can't justify the outlay for a high-end pan, but this was £2.49 - if it all goes horribly wrong, I'm hardly out of pocket. And if it's beautiful maybe I'll start saving my pennies for the Rolls Royce of bundt pans. I associate bundt with Germany or Austria. Rich, central European cake, that has an architectural beauty. As far as I can tell there isn't a 'Bundt' recipe, it's just whatever cake comes out of a pretty bundt pan. But I also associate spiced cakes with germanic countries, so that seemed like a fitting cake to make. I have a cupboard full of dried apricots at the moment so I thought it might be nice to use them up and honey seems a natural companion to that. I had a mooch about the internet for apricots and honey and I found a recipe for a cinnamon and apricot cake. Ding Ding Ding, we have a winner. I scaled the recipe down for my pan size but the original was double this, for an 8 inch round, if you fancy making a big one. The original baking time was 1hr 20 at 170c - I put mine in at 150c with a Bain Marie for 30 mins and it was slightly overdone. 25mins would have been fine. Pre-heat oven to 150c (170c if making an 8inch). Butter and base line you cake tin. Do use butter, not oil, I tried to oil my tin and it just all ran into the grooves. Stir in the sugar and apricots. Make sure the apricots are evenly distributed and covered. I made sure mine were all broken up into individual pieces, no clumps. Mix the honey and milk together and add to the dry mixture with the eggs. Mix well with a metal or wooden spoon. This is a firm batter so spoon it into your cake tin and level it out. Bake for 25min until firm to touch, turn onto wire rack, while warm glaze with runny honey then glaze again while cooling. Mix the honey and icing sugar together until it forms a smooth pourable Glace Icing. You may need to warm up the honey or add a little hot water. Pour over cake once cool. And now I am hooked - I'll be dumping every recipe I know into this little tin. The pattern wasn't as bold as I might have liked, but it was subtle on the tin itself, so that's to be expected. 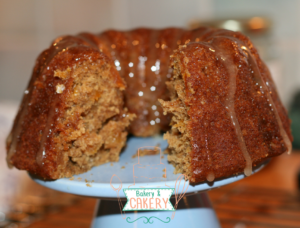 Have you ever made a bundt? What is your favourite pan?